Reside in southern most of Banjarmasin city, exactly in the Kuin River. The “Floating Market” was existing very early in that territory. Floating Market opened it activity just at dawn about 04.00 am. until 07.00 am. With small ships was called “Jukung” around the river that was commerce activity, it could be unique scene when you saw many of the ships with passengers their ships bought and sold their marketable goods above the ships that near related each other.If you would intend go there. First, you must ride in Jukung or Klotok “the bigger ship than Junkung” at Kuin ships harbor when it was dawn time. If you ride on that ship, it will carry you to Floating Market during a 20 minutes trip. At that moment, you will enjoy the dawn atmosphere in the middle of the river. How beautiful, isn’t it? And about cost to go there is not too expensive, just pay about $2 for a round trip. 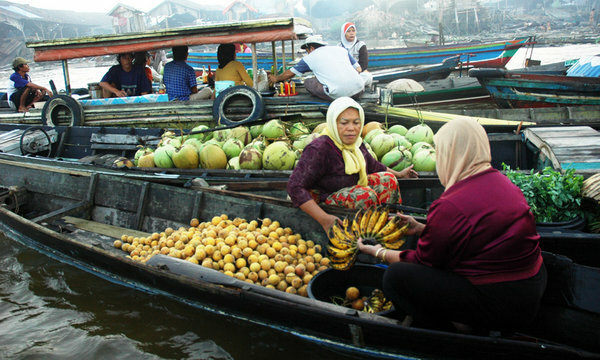 At ‘Floating Market’, there are many vegetables, cakes, and goods on sale by sellers at their ships. Most of these are old people that still defended this heritage. There is also ‘Mini Floating Café’ that provides Banjar food like Soto Banjar, Nasi Kuning etc. Unhappily, the existence of ‘Floating Market’ is threatened by the existence of modern markets now. Along with many roads and lands also is one reason for the slack of this market. Otherwise, the dirty rivers will be lacking the ‘Floating Market’, could this market defend? Thanks to Ms. Kana Foutch for u'r editing.